Sutt, Cameron 2014. The Early Árpáds (895-1095): Consolidation, Christianization, Monarchy. History Compass, Vol. 12, Issue. 2, p. 150. Melve, Leidulf 2003. Literacy --Aurality --Orality A Survey of Recent Research into the Orality/Literacy Complex of the Latin Middle Ages (600-1500). Symbolae Osloenses, Vol. 78, Issue. 1, p. 143. The period of the tenth and early eleventh centuries was crucial in the formation of Europe, much of whose political geography and larger-scale divisions began to take shape at this time. It was also an era of great fragmentation, and hence of differences which have been magnified by modern national historiographical traditions. 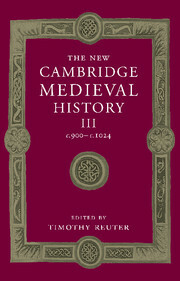 This volume of The New Cambridge Medieval History reflects these varying traditions, and provides an authoritative survey in its own terms. The volume is divided into three sections. The first covers general themes such as the economy, government, and religious, cultural, and intellectual life. The second is devoted to the kingdoms and principalities which had emerged within the area of the former Carolingian empire as well as the 'honorary Carolingian' region of England. The final section deals with the emergent principalities of eastern Europe and the new and established empires, states and statelets of the Mediterranean world. This book covers a period in European history best described as the long tenth century, stretching from the 890s through to around 1020/30. It explains a contrast between the Latin west and the courtcentred cultures of Byzantium and Islam. Some kinds of material remains have escaped historians' general neglect of non-written sources, most notably those traditionally studied by art historians: painting, sculpture, goldsmithery and ivorywork, architecture. The post-Carolingian core of Europe retained a residual sense of pan-Frankishness long after kingdoms, had started to develop their own sense of identity. It is significant, therefore, that Italian and Spanish historians have been heavily influenced in recent years by the concerns of French medievalists. The chapter also discusses the anomalous historiographical traditions of Byzantine history and European Islamic history. For Americans whose secondary or primary ethnicity is eastern, central or southern European, they are not even the most important ones. Blinded by classical towns or fascinated by the mosaics which decorated a few exceptionally rich houses, ancient historians have refused to admit, in spite of archaeological evidence, that to the left and to the right of the Rhine, the Germanic and the Graeco-Roman rural economy were in much the same state. The basic unit of daily life was the family. The historian who examines the family of the first half of the tenth century will find three levels. This chapter suggests that the evolution of family structure was accompanied by the presence or the persistence of human groupings such as the hundred or even simply parishes. It shows why people needed to make a survey of cultivated lands before examining the environment. From the tenth to the eighteenth century it was the seigneurie in which the men of Europe lived, in forms showing wide chronological and geographical variation. The beginnings of the European town in the form known to us from the late Middle Ages lie in the tenth century. The trading of Islamic merchants was shaped by a detailed legislative framework based on writing. In the regions outside the old Roman Empire incorporated into the Frankish empire during the Merovingian and Carolingian periods, people find very varying beginnings for quasi-urban settlements and for mercantile centres. Markets for wholesale and long-distance trade, merchants' inns, and also markets for the agrarian produce of the hinterland lay on the periphery. In the transalpine regions of the former Frankish empire, in what were becoming France and Ottonian Germany, the development of towns took a quite different path. Although the development of towns and markets in France, Lotharingia and Germany was strongly influenced by regional political forces, the Ottonian rulers played a decisive part. Monarchy could take the form of empire. Only in Italy perhaps, among western lands, was there still a sense of Constantinople as the imperial centre of the Roman world. Tenth-century historians, namely Widukind, Liudprand, Flodoard and Richer, produced powerful images of royalty. In this respect, Italy in the tenth century was different from other post-Carolingian lands. And even in Italy, but still more clearly elsewhere in Frankish Europe, an ideal-type of Carolingian government was transmitted to the learned through the written residue of capitularies, conciliar decrees and documents. In the course of the tenth century, the patrilinear dynastic link with the Carolingians was broken in both west and east Frankish kingdoms. In 888, the old Carolingian realms had created kings out of their own guts. The west Frankish kingdom has been treated in much recent historiography as a tenth-century paradigm. The caliph's response to the tenth-century Ottonian kingdom prefigured that of many modern historians. The history of the church in Europe in the tenth and early eleventh centuries is essentially the history of many local churches, in which the dominant role in secular ecclesiastical and religious life was played by the bishops. Parish churches are associated not only with smaller units of a city, such as those created by Bishop Burchard in Worms in the early eleventh century, and with areas in the countryside, but also with individual lords' estates, the so-called Eigenkirchen. The charters witness to contact being maintained between the papacy and churches in England, France, Spain and Germany as well as in Italy and Rome itself. Ever since their first bishop, Anskar, had preached the Gospel in Denmark and Sweden, the bishops, in the way Adam of Bremen tells their story, directed their energies towards establishing the church in Scandinavia. The conciliar decisions of the tenth century overall have a clear and acknowledged debt to Carolingian church councils. In every medieval century in Europe monastic life was renewed, and renewal might indeed be said to have been a characteristic of medieval monasticism. Moreover, many monasteries, in the German kingdom in particular, did not decline during the Ottonian era from the level they had reached in the Carolingian period. This chapter focusses on the impressive forces working for a renewal of monastic life in the tenth century; but in order to speak of reform monasticism in the tenth and eleventh centuries and of a movement which experienced a first wave in the tenth century. The careers of Benno and Eberhard of Einsiedeln, Einold of Gorze and Romuald all show that the eremitic monasticism of the tenth and eleventh centuries could not remain independent alongside coenobitic monasticism. However, the testament in which the first abbot of Cluny, Berno, defined his monastic inheritance dates from 927, when Abbot Odo, under whom Cluny became a centre of reform, took over the monastery. Intellectual life in this period is often given labels which relate to other politico-cultural events and phenomena: the post-Carolingian or pre-Gregorian age. The Carolingian renaissance largely ended Germanic oral tradition and popular culture, and created a need for a written culture based on manuscripts. At the end of the century Æthelwold's pupil Ælfric, who became abbot of Eynsham, represented the highest pinnacle of Benedictine reform and Anglo-Saxon literature. During the Carolingian period schools and intellectual life ran on parallel paths, and schools were equated with culture; even imperial culture under Charlemagne was conceived of as a school. The intellectual centre of Europe still lay in France, Burgundy and Lotharingia, where Carolingian culture had developed most fully. This chapter referres a number of Anglo-Saxon hagiographies and shows what might be termed missionary writings from the eastern frontier of Christianity. Intellectual production during the whole century was notably historiographic. One church of novel character which can still be seen is that of St Martin de Canigou, dating from the earliest years of the eleventh century, and built under the patronage of Count Wifred of Cerdaña. The Pyrenees, as Puig y Cadafalch long ago showed, was an important region for the early development of Romanesque styles. As patrons of art Archbishop Egbert and Abbess Matilda may have had at least one point in common, desire to bolster a vulnerable authority. The finest French book art of the tenth and early eleventh centuries drew its inspiration first and foremost from Carolingian and pre-Carolingian traditions of that region. This chapter shows how Ottonian book-illumination began, after the long hiatus from the late ninth century to the 960s, generally presumed to be caused by external threats and unsteady politics. The greatest book painter of the early period of Ottonian artistic efflorescence was the Gregory Master. Charles the Fat had been able to reunite the Carolingian kingdoms and, apart from Provence, had exercised direct rule over all of them. Unlike Charles, who had accepted the west Frankish crown offered him in 885, Arnulf of Carinthia rejected a corresponding offer from the west Frankish magnates. Franconia and Lotharingia were former royal provinces, whose political organisation stemmed from the Carolingians; Suabia, Bavaria and Saxony were ethnically defined regions. The phrase Francia et Saxonia, used by Otto I and later by Widukind of Corvey and Adalbert of Magdeburg, corresponds to the actual structure of the Reich. Instead of the device renovatio imperii Romanorum used by Otto III Henry adopted the formula renovatio regni Francorum, which had already been used on the imperial bulls of Louis the Pious, Charles III, Arnulf and Wido of Spoleto. Acomparison of the Rheims electoral dispute of 989-97 with that of 940-48 shows how France and the Ottonian Reich had developed away from each other. The conquest and incorporation of Saxony into the Carolingian empire, which Charles the Great achieved after long and bitter struggles, had far-reaching consequences for the political and institutional organisation of the Saxons. The Ottonian rulers naturally could not avoid giving offices and tasks to Saxon nobles from which a pre-eminence within the people might have been derived. Saxony in the Ottonian era was rich in centres from which royal lordship was exercised. The active role played by female members of the Ottonian family in Saxon politics is also evident in the succession of Conrad II in 1024-25. Military conflict with the Elbe Slavs was essentially a matter for the Saxons, and as far as we can see primarily for the Saxons living along the borders. Saxon historiography of the tenth century can thus hardly be characterised adequately as 'Ottonian' historiography, still less as 'Ottonian house tradition'. In the summer of 814 Louis the Pious had organised the Frankish subkingdoms, among which Bavaria was named for the first time. A further tradition of Carolingian Bavaria was its polyethnic structures based on Roman, German and Slav traditions, and its openness to the south and west. Among the Slav neighbours of Carolingian Bavaria the Moravians had formed the most powerful polity both in political and in ecclesiastical terms. Arnulf was evidently still a young man when he began to restore and consolidate the Bavarian regnum after his father's death in 907. Arnulf acknowledged the integrity of the east Frankish kingdom and in return was able to retain his quasi-regal rule over Bavaria; indeed, it was probably Henry's recognition which first enabled him to establish it firmly. In the second half of the tenth century there was a noticeable increase both in intellectual activity and in the use of writing in the Bavarian bishoprics. The kingdom held by Zwentibald, who died on 13 August 900, became a duchy with the same boundaries, known from the start by the convenient designation of Lotharingia. King Charles was subsequently able to appoint his notary Gauzlin to the see of Toul in 922, but if everything was still running smoothly for him in Lotharingia things were very different in west Francia. One might say that from the accession of Otto I to that of Otto III, even up to the accession of Hugh Capet, Lotharingia had the character of a Francia media, disputed between its two neighbours much as the kingdom of Lothar II had been earlier. The division of 959 took effect on Brun's death, but Godfrey, to whom lower Lotharingia had been entrusted, had already died in Italy in 964, and was not replaced immediately. Lotharingia has always been a transit zone. Calligraphy was a Lotharingian speciality. The region known as Burgundy has had some of the most elastic borders of any region of France, and some of the various regions called 'Burgundy' at different times barely overlap at all. Imperial Burgundy included both the region around Besançon and Geneva, the heart of the Burgundian kingdom of four centuries earlier, and the region from Lyons and Vienne south to Arles and the Mediterranean. This latter, more southerly part of imperial Burgundy was sometimes called lower or cisjurane Burgundy and sometimes called Provence. This chapter focusses on the history of both halves of imperial Burgundy, including upper Burgundy and Provence, as well as that of the region which later became the French duchy of Burgundy, between the late ninth century and the early eleventh century. Radulf, the king of France who confirmed Charles-Constantine as count of Vienne after the death of Louis the Blind, was also a Bosonid, son of Duke Richard le Justicier of French Burgundy. At Charles the Great's deposition, the regnum Italiae, whose capital was Pavia, included north Italy from Piedmont to Friuli, Emilia as far as Modena, Tuscany, the Marches and the Abruzzi. The tumultuous immediate post-Carolingian period was dominated by the rivalry between Berengar and Wido, who were both typical products of a political transformation which had its roots in the hierarchical social order of the Frankish empire. Otto's reign immediately distinguished itself by the interest shown in Rome and in central and south Italy. In 967, Otto I raised his son to the position of co-emperor and began negotiations to obtain the hand of the Byzantine princess Theophanu for him. Despite the dealings between the two courts, there remained a certain amount of tension between them because of the renewed royal and imperial interest shown by Otto I in south Italy. The regional power structure in Italy just before the millennium shows the balance achieved between stability and innovation. The tenth century was crucial in the evolution of the west Frankish kingdom. Whereas in 898 its future was uncertain, with either reabsorption into a larger empire or disintegration into smaller units clearly possible, by 898 it was firmly on the map, albeit with ill-defined frontiers and a debatable political character. In 898, the wind seemed set fair for Charles the Simple. If the victory at Chartres did not put an end to invasions on west Frankish soil, it did create a substantial breathing space. Immediately Charles determined to exploit this by attempting to reverse the 880 restoration of Lotharingia to the east Frankish crown. The west Frankish realm was riven by Carolingian pretensions in Lotharingia. Thereupon a council of the west Frankish aristocrats, guided by Adalbero of Rheims, rejected the claims of Charles of Lotharingia to the throne, and elected Hugh Capet. Any history of the west Frankish kingdom inevitably highlights the king's relations with his princes. The area over which the 'west Frankish' kings exercised meaningful authority contracted during the tenth century and new units of power emerged. These have customarily been termed 'territorial principalities' since the publication of Jan Dhondt's important book. Modern French historiography nevertheless remains undecided on the extent of continuity from the Carolingian period. The notion of the northern principalities as 'un prolongement carolingien' is deeply embedded in modern discussions. The principality of Flanders certainly evolved directly out of arrangements made during the reign of Charles the Bald, but its final shape was the result of the military achievements of its rulers. The beginnings of the principality of Blois Chartres Tours are similar. The Historia Normannorum of Dudo of Saint-Quentin, commissioned in the late tenth century for the Norman counts Duke Richard I and II, is the first instance of 'history' written to present a version of a principality's history. For the western Frankish kingdom, Odo's reign initiated the era of principalities: hegemonies over cultural or ethnic entities which revived the former territorial units making up the regnum Francorum. Sources from north of the Loire largely ignore what was happening in the south: the Annales of Flodoard contain only a few scattered references to southern events, mainly during Radulf's reign. Gascony soon became a 'national' principality, in which a culturally and linguistically homogeneous population was subject only to the authority of native chieftains. The tenth century was the age of the principalities: still in formation in 900, they were in decline before 1000. Catalonia in the second half of the tenth century does, however, answer to the definition of a territorial principality. The decades around the millennium were a turning point in the history of the southern principalities. The southern princes thus forcibly declared an independence hitherto restrained by their loyalty to the Carolingian order.